Purse seine is constructed with multiple strands of crimped lead alloy within a braided polyester sleeve. The composite core is then over braided with high tenacity, low elongation, white, polyester yarn to maximize tensile strength, flexibility, and abrasion resistance. 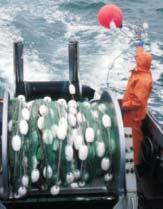 Novabraid purse seine leadline is non rotating, spliceable, and can be recognized by its black longitudinal hanging.